Cool view of snow and desert: Mt. Rose (left) and Eastern CA desert (right). Wow, I did a lot of stuff in one weekend! Sadie and I trial ran what it would be like sleeping in a roof top tent, we actually found some decent backcountry snow near Mt. Rose on a super hot weekend and I did my first outdoor climbing since my injury. 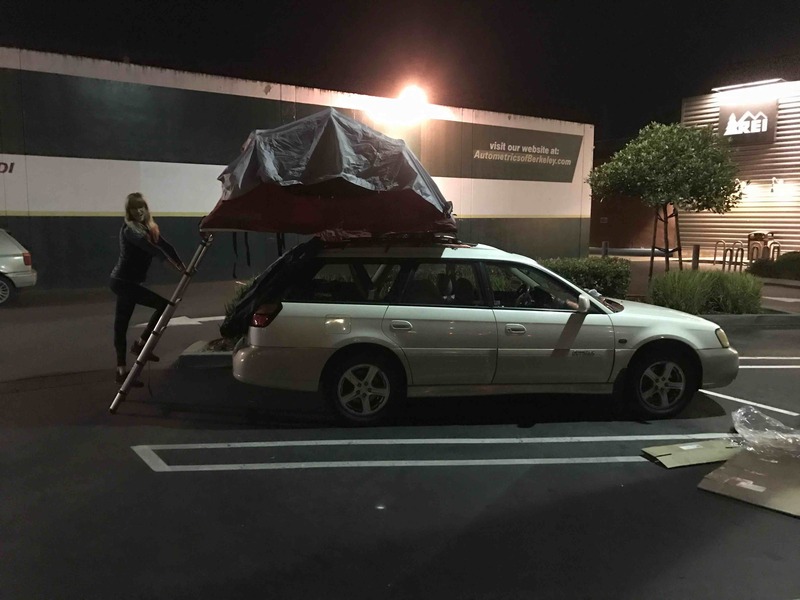 Kicking the weekend off, Sadie and I purchase our roof top tent Friday night and began assembling it by street light in the REI parking lot. The origin story for why we chose a roof top tent is that its way nicer than sleeping in the car if you are living on the road every day and way cheaper than outfitting a van. Attaching it to the roof rack only took an hour, but after that it only takes 30 seconds to pitch or put away each time. Wow! (Still figuring out condensation in colder temps). We got a late start heading up to Tahoe, but with the super-tent we quickly found a comfortable night’s sleep in a parking lot. The next morning we headed up towards high elevation, northern facing terrain which would be the most likely to maintain decent snow in the 50 degree Tahoe weather. 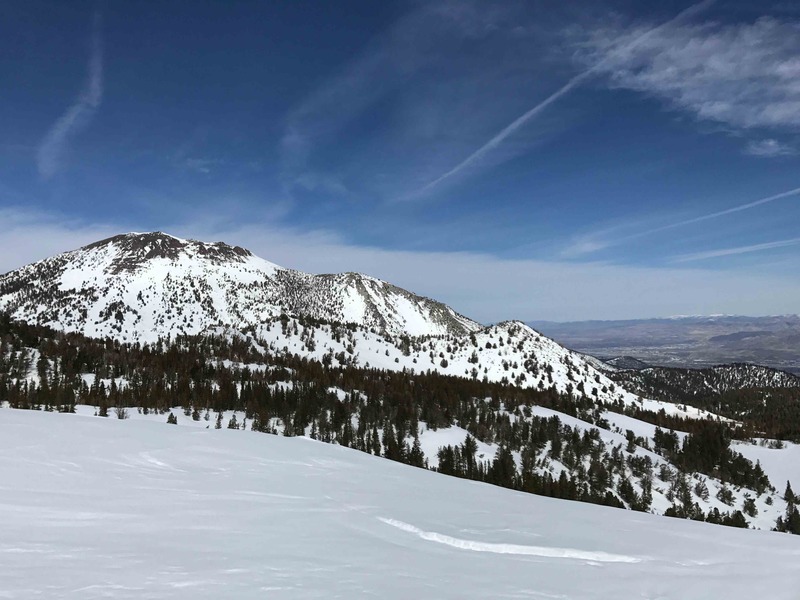 Our objective was The Hourglass route off Tamarack Peak which should be gentle enough for me to ski down. Skinning in from the trailhead we took the far left trail which cruises by Tamarack Lake and then reached summit by southeastern ridge line. This wasn’t the most direct approach, but it worked. However, going either straight or right paths from trailhead would have likely gotten you there more quickly. Heading up the Southeastern ridge. You can see some of the cornices formed on S/SE faces ahead cast a shadow. On top of Tamarack it became windy before dropping into Hourglass Bowl, an enjoyable 1000 ft decent. The most Northern slope had good snow, but this transitioned to super hard compact snow on the Eastern slope. I linked a few turns, but had a harder time on the steeper section than expected. 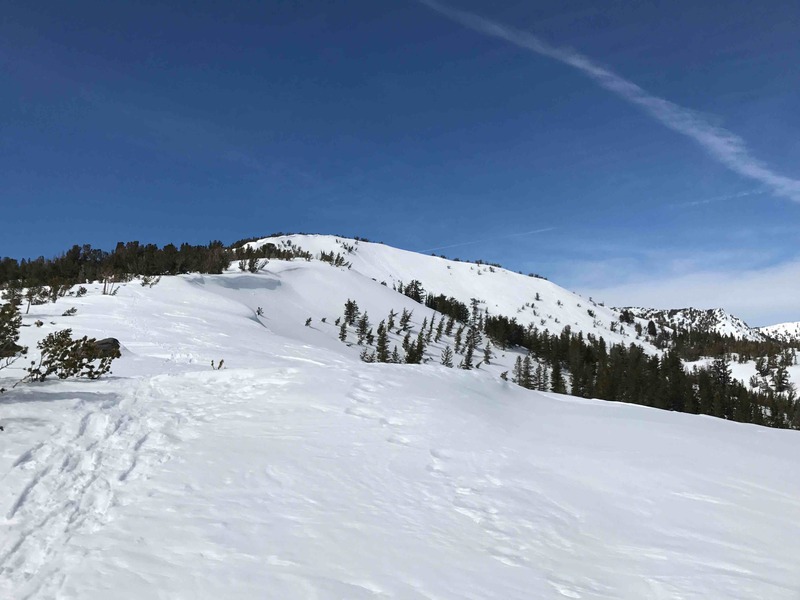 We climbed back up and across the first ridge and reached Tamarack peak again via the second ridge. Traversing ridge one before gaining ridge two ahead to Tamarack to have another go. This time we descended via the “Short but Sweet” route off Tamarack (click on the map to see routes). It was much steeper and I had a hard time given the snow was only a little better than the East facing crust off hourglass. Lastly, we descended the route through the trees, scooping left a ways before heading right just before the parking lot. 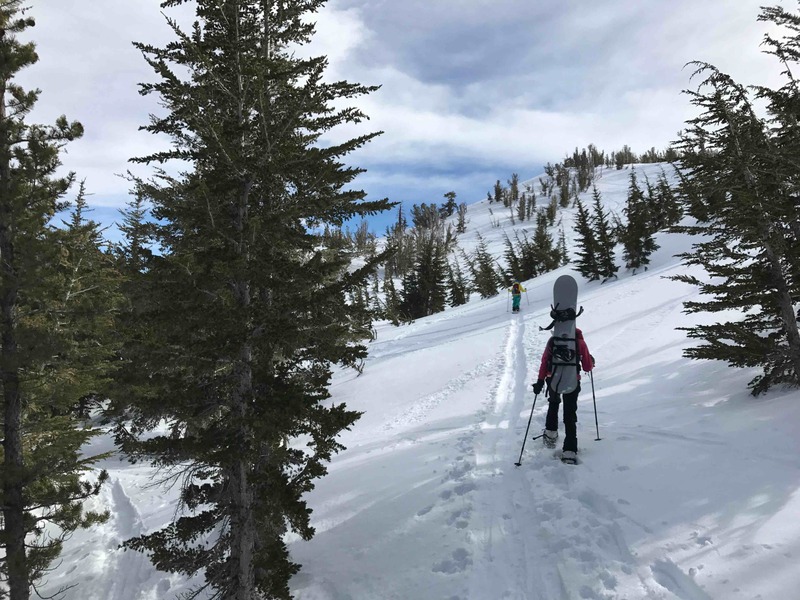 I had a harder time skiing than I had expected and was pretty hard on myself, but it was a fun day in the backcountry. Given the lack of options in Tahoe for high elevation peaks we decided to climb some rocks on Sunday instead of skiing again. Waking up refreshed from our car top tent we headed to Auburn Quarry. A plentifully bolted limestone area with lots of moderate or easier climbs. It was perfect temperature this time of year (its very hot in summer) and this was my first lead since injury three months prior so a big deal for me. View from Horseshoe Canyon towards the quarry entrance. Memorial Wall (left) and Scale Wall (right). The fear of falling when above my last protection was much stronger than I remember, especially on a bolted route. I once was comfortable enough to fall on the second clip a dozen times working a route here. It probably also has something to do with feeling less strong in my grip and therefore less confident. 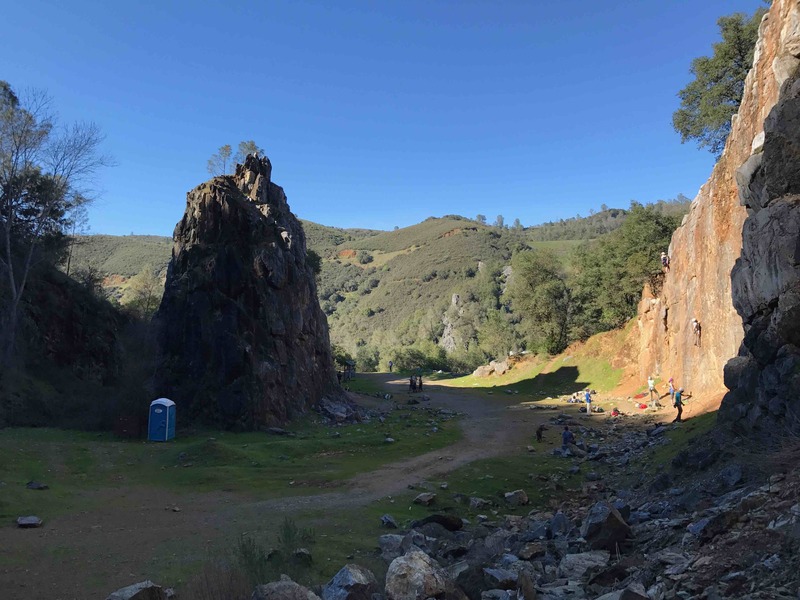 However, I accomplished my goal of leading a 5.10b climb so big win for me! My ending feeling for the weekend was that its really cool to live in a place where I can ski one day and rock climb the next. On to the next adventure!